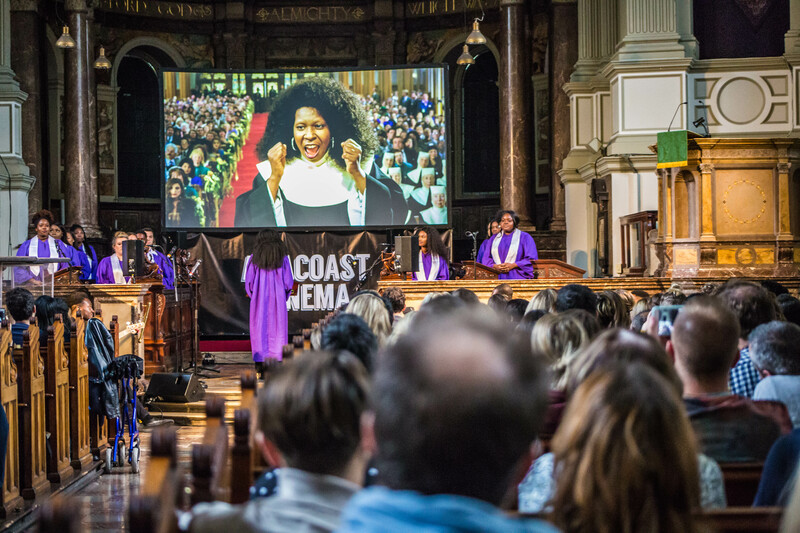 On Friday evening, I attended the press night for Sister Act Live, the live cinema event produced by Amacoast, which merges a live choir and concert experience with a screening of the classic comedy-drama. It must be said, for some reason I expected it to be a small intimate affair so was quite taken aback when I arrived at the venue and saw a long sea of people snaking around the ever-so-grand Central Hall in Westminister awaiting entry. I’m not one for queues so thankfully within five minutes my plus one and I were standing in the foyer being instructed on where we should collect our tickets. After grabbing a few drinks, we headed to the entrance of the screening but was promptly told we were not allowed to bring alcoholic beverages into the main hall (oops). Neither of us are huge drinkers so it was quite the challenge attempting to down a glass of wine in a few minutes. By the time we neared the final gulp, the ushers informed us that they were shutting the doors as the performance was about to start. The hall was filled to the rafters, so much so that my friend and I were told that although our press tickets granted us seats near the front, most of the spaces were taken so we were unable to sit together. That soured the experience somewhat but the atmosphere in the hall was so overwhelmingly positive that we simply shrugged our shoulders, waved goodbye and went to our respective seats. The evening started with an electrifying mini praise and worship concert performed by a choir that had the whole venue on its feet whooping, stomping and waving in the name of Jesus. At one point the energetic leader instructed the crowd to take a selfie with the person standing next to them, and we dutifully obliged. Next, a sweet serenading duo performed a touching and emotionally stirring Gospel song in tribute to those who recently lost their lives in Westminister. It was really a beautiful moment. Now I’m gonna assume that most of us in the audience had seen Sister Act, although it was quite warming to see quite a few young faces in the crowd who may have been watching it for the first time. I’d say I’m more of a Sister Act II fan, and like nothing more than watching it snuggled under a blanket every time it is shown during the Xmas or Easter break. Sitting at the screening, I had to refamiliarize myself with the first installment, which was a good thing, because it prevented boredom from creeping in. I was struck by how charming, funny and idealistic the film is – warm and fuzzy feelings were indeed induced. It occurred to me that wholesome family films are somewhat a thing of the past now, so I appreciated the nostalgic trip down memory lane. And what of those iconic songs? 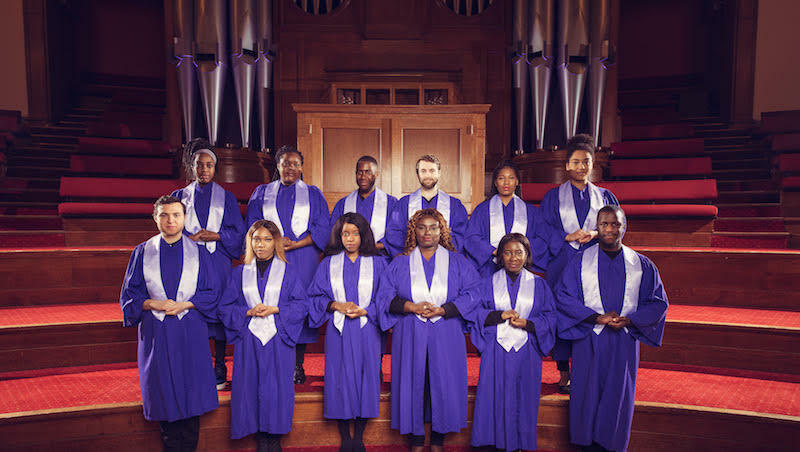 The choir took to the stage during the main musical numbers, blitzing through the iconic soundtrack featuring a mix of 60s pop-soul classics: My Guy, Rescue Me, Shout with classic hymns such as I Will Follow Him (which was so beautifully harmonised it gave me chills) and Joyful Joyful. The only negative I’d say is that dubbing out the voices of Whoppi et al took away something from the overall experience. The music performance scenes were a huge part of the comic relief provided in the film so it at times felt like there was a bit of a disconnect between what was happening on the stage and the onscreen action. The night wrapped up with a bit of a singalong, reprising those clap-along gospel classics before we went our merry way. Massive kudos to Amacoast for pulling off such an ambitious undertaking. Watching the film and hearing the performances in such a vast and decadent place of worship – with its high ceilings, ornate baroque style architecture and clear acoustics – definitely heightened the experience. Despite a few hiccups as mentioned earlier, it was a fun, heart-warming and memorable evening. 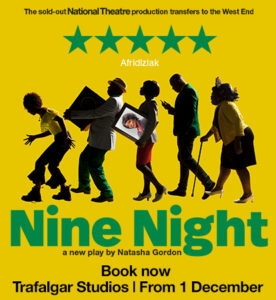 The next performance will take place on April 28th and 29th, for tickets visit here.